Bluff City Theater is fortunate to have acquired the iconic Farmers and Merchants bank building at 212 Broadway in 2014. 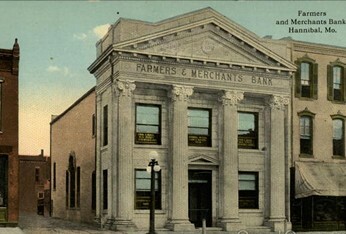 This neo-classic structure with a limestone facade was constructed in 1910 as the second Hannibal location for F&M Bank. It operated continuously until 1970 when the bank moved to its current location in the 500 block of Broadway. Subsequently, the building housed a short-lived Air and Space Museum, a bookstore and a boutique before sitting vacant for several years. Much of the original architecture remains intact, including original woodwork, a marble entrance-way and the four magnificent Corinthian limestone columns that support the entrance portico. Unfortunately a later interior renovation to add forced-air heating and air-conditioning covered over the intricate plaster key molding and decorative cornices in the ceiling, but they are still partially intact above the suspended ceiling. One feature of the building is an original stained glass window that now hangs on the west wall, and was discovered hidden behind the plaster when a loading door was cut into the wall. The building has a colorful history including having been robbed by a gang reputed to be John Dillinger’s in the 1930’s. Legend says that bullet holes are still visible in the ceiling plaster. In 2015, the main banking hall was converted into a 90 seat “black-box” performing space. Theatrical sound and lighting has been added. Seating is reclaimed, having graced the auditorium at Hannibal High School for over 70 years. The wooden seats feature intricate Art Deco iron end plates. New public washrooms have been added off the lobby that still feature the original windows, flooring and woodwork. When completed, the new Bluff City Theater will be home to our performances as well as many others including live music, dance and film.